I did not participate myself in this larp, but I have been following it since I first heard about it and I hope that this post gives at least a small insight to the project. Several of the Palestinian and Finnish organizers were involved in production of the fantastic larp Till Death Do us Part, that I participated in, last year in Palestine. 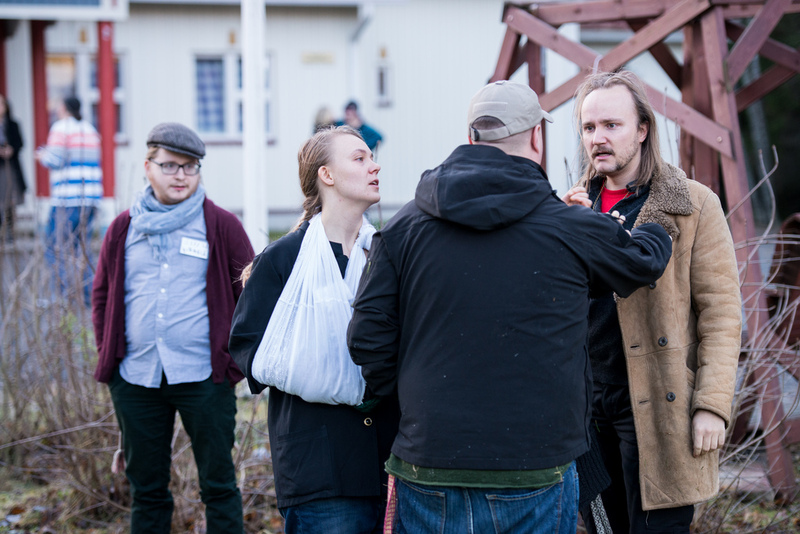 During the larp Tuomas Puikkonen took several great photos. Here is just a selection and you can find all on Flickr. Halat hisar was organized by Fatima AbdulKarim, Faris Arouri, Kaisa Kangas, Riad Mustafa, Juhana Pettersson, Maria Pettersson & Mohamad Rabah together with several helpers. Organizer working with concept, design, production games mastering and media as well as playing supporting characters. A key moment in the game for me personally was early in the game, then the characters organized a protest against the military presence on campus. It’s spontaneous moments like that which tell you that the game is coming to life. Sometimes as an organizer those moments are hard to see if you’re not in the game, but a demonstration is impossible to miss. I was amazed at so many of the things I saw during the game, and how the players really threw themselves into it. Late night scenes when the characters linked arms and sang together as soldiers tried to wrest people away to be taken to interrogations were immensely moving. For many Finnish players, the role of nationalism in a struggle against an occupation came as a surprise, since most national symbols in Finland have been appropriated by the political right. It felt surprising to have a connection to those symbols, created through the fictional setup of the game. It created a distinction between the nationalism of the rich and comfortable and the nationalism of the oppressed. Organizer working with concept and design and resposible for the black box during the larp. Also playing Shafeeq Ahmad A-Najati, the visiting Jordanian Minister of Culture. Halat hisar went very well from organizer point of view, with the main goal of raising the awareness about how life under occupation is as well as the the feeling of nationalism, feeling proud of your country and your culture were all achieved. For one year we were working on this larp, and for me it was a historical. We are thinking to run it again in different countries, and the Swedes have shown very big interest about that. Maybe we need to adjust some plots and stuff in the game, especially for the international players who played as an outsider. Otherwise the game was perfect. As a Palestinian I never seen something that reflect the life under occupation as this larp did. You can watch a documentary, you can feel solidarity with the people, But it is a different feeling when your country is occupied. One thing I’ve been thinking of is that the threat of violence in Halat Hisar felt for me very real – more real than in any other larp I’ve played. Of course this was partly because the totally unarmed university people were harassed by armed troops, but also maybe because the violence was used to maintain a status quo and not to resolve a conflict. Which probably reflects somehow the situation in Palestine. The larp was really stressfull and intense. I haven’t really thought about the game on purpose for a week or so, to distance myself a bit. Now I’m starting to read up the backround material of the Palestinian conflict. Playing Tuomas Kallo, a student, and one of the two Social Democrat candidates for Student Council Chairman. I went to the game expecting to experience life in occupied Palestine, but set in Finland. The game delivered beautifully the complexity and harshness of life under occupation, was a very strong experience. Surprisingly the larp also offered another theme, equally strong. It created a sort of positive contemporary Finnish nationalism, something most of us players were completely unfamiliar with. Finland has been occupied first by Sweden and then by Russia. The idea of a Finnish nation was born under Russian rule, and most of our national symbols hail from this era. Since then they’ve been completely taken over my the conservatives and the extreme right, so it was very interesting to experience them as sources of strength. Halat hisar was a very good larp.